A new look is coming to Pope Park. Talk of renovating the park has been in motion for over a year now, as well as fundraising. Last week, the city council got a preview of what the park’s new design will look like, thanks to the city’s longtime engineering consultant, Hennessey Engineering. The company created the new design for free. It still includes removing the iron gating that the city received from the old Dodge Main plant that was torn down in the early 1980s. Kathy Angerer, the city’s Director of Community & Economic Development, recently handed out copies of the new look to the council. She said it will take about $100,000 to complete the project, of which the city can tap into $30,000 from a state-funded development grant the city receives each year. The iron gating isn’t the only thing going away. The distinctive red bricks will be torn up and replaced with more decorative pavers. More landscaping also will be included. The first phase of the work will begin soon. Bids for the project are due next week, and that’s to do cement work, install lights and remove the iron fencing. The iron gating, which has a lot of historical significance to the city, will be handed off to the city’s Historical Commission. As for the monument, Angerer said it appears to be in sound shape. 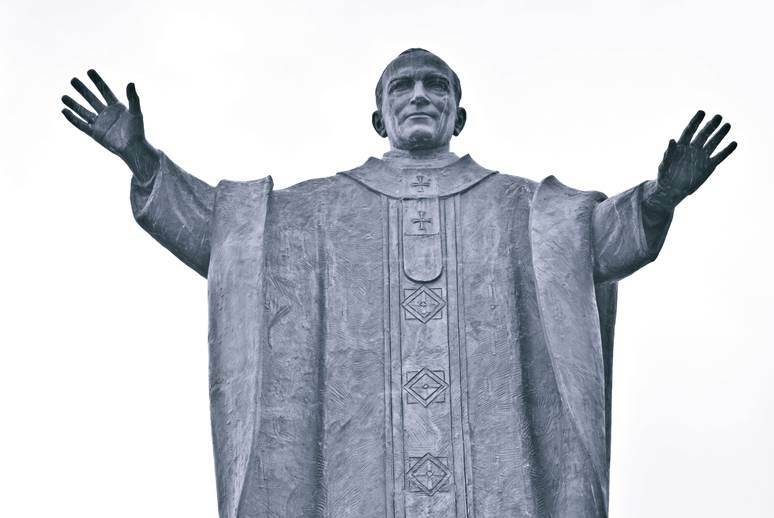 Pope Park was created in 1982 in celebration of Cardinal Karol Wojtyla being appointed the first-ever Polish Pope. Although it is not customary to create a statue of a living person, such was the overwhelming pride of local Poles. The Pope actually got to see the monument, designed by the late Bruno Nowicki, when he motorcaded past it in 1987 during his visit to Hamtramck. Pope John Paul II went on to deliver a speech at Jos. Campau and Holbrook, which was then an empty field. A giant stage was built just for the occasion. You can see a small replica of the stage right at the corner of Jos. Campau and Hewitt. The park had been privately owned until several years ago when it was donated to the city. It is a major attraction for visitors. Fundraising to improve the park is ongoing, and you can contribute by making out a check to the “Karol Wojtyla Park Committee,” and mail it to: P.O. Box 12248, Hamtramck, MI 48212. The committee is a registered non-profit organization so all donations are tax-deductible.